Personality: Curiosity often guides Fiacre's path toward hostile situations and although in most cases she prefers to avoid fights, when challenged or provoked by outsiders the instinct to fight to the death overrules all. She does have a rather odd personality foraged from traveling on her own for months. Those who perceive her to be a gentle, friendly wolf with an even temper could be proven wrong. Due to her past, the fae does relate to other wolves' losses and displays her sympathy for a short duration of time before returning to her neutral self. However, hostility and violence has played a vital role in her upbringing and experiences. Often times hatred burns within her, an ember of irritation awoken from small actions. Loyalty runs deep within her heritance but does not prevent the northern wolf from plotting her deadly revenge. War and disputes are Fiacre's forte, she is constantly submersed in the inevitable siren songs of a voice. It is her constant companion, hardly ever giving her peace. It whispers to her, mocks her, and coaxes her darker side to the surface constantly challenging her stability. At times the voice seduces her into it's plots and her actions adjust to follow the radiant plans only realizing the consequences after she has fallen prey. In hopes of escaping the darker side Fiacre often seeks solitude, finding comfort on her own when she is battling the environment or the company of those she is close to and trusts. Alone, the wolf can search for the freedom she strives for. Her every waking out of taking commands brands her, sending physical agony through her as she wishes to break the shackles chaining her, imprisoning her. Taught never to flee from the face of battle, Fiacre's every breath is spent waging wars to survive. Appearance: Built for both speed and battle, the advantage often gives the fae an ascendancy during wars along with her acquired skill set from the north. Adorned in onyx, the female holds the upper hand at night as she secrets herself in the darkness away from the preying eye of her victims. Her optics are a startling shade resembling melted gold; the golden irises hardly ever betray any emotions the female experiences except when she is enraged does the fire spark in her optics. The jaws bestowed upon the femmora are as cold as her gaze, both seek the vengeance and the thrill of death. 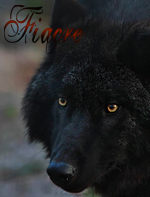 Wolf Type: Due to a genetic mutation, although Fiacre is an arctic wolf her fur is dark as night. Very impressive biography, Fiacre! Glad to have you with us!